In each diagram, the sum of the upper left and upper middle numbers is written in the centre box, and the sum of the upper right and upper middle numbers is written in the lower central box. 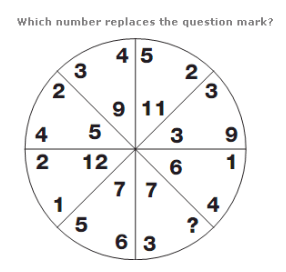 The number at the centre of each segment equals the sum of the numbers on the outside of the opposite segment. Looking at the diagram as two columns, numbers in the left hand column increase by 5, 6, 7 etc, and numbers in the right hand column increase by 6, 7, 8 etc. 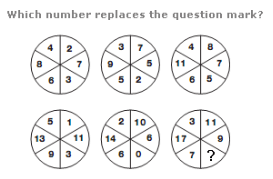 The numbers in the lower circles equal the numbers in corresponding segments in the upper circles multiplied by two, then subtract 3 for the left hand circle, 4 for the middle and 5 for the right hand circle. 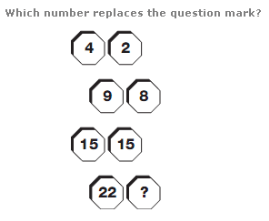 Moving from left to right, numbers follow the sequence of square numbers, from 6 to 10, subtracting 4 each time.